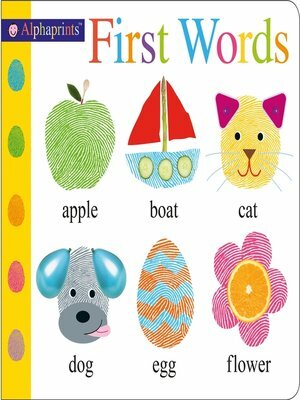 Adding to the stable of bestselling Alphaprints titles, First Words is a must-have word book for babies and toddlers that sits alongside Alphaprints ABC, one of American Baby Magazine's 24 Best Baby Books of All Time. This casebound board book has over 40 first words to learn, accompanied by the quirky Alphaprints animals and objects created using fingerprints and photographs of everyday objects. Each spread is themed—pets, park, vehicles, toys, farm, food, colors and animals—and the fingerprints are embossed for lots of see-touch-feel fun. This is the latest addition to the Alphaprints series, which has sold over 1,000,000 copies in the US alone, and is published around the world in 13 languages.